Solidarity statements and op-eds are important, but direct actions are essential. 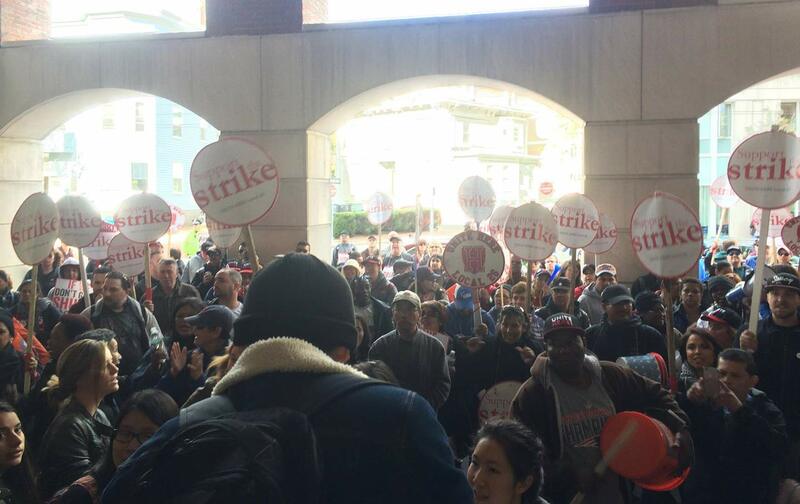 Last night, Harvard University Dining Service (HUDS) workers ratified a new contract with the university following a historic strike that lasted 20 days. “I can report, coming out of our contract ratification meeting, that we achieved every goal without exception,” said Brian Lang, president of UNITE HERE Local 26, the union represented the workers in the negotiations. The contract, which raises the minimum pay for dining workers, requires Harvard to pay for any increases in health-care co-pays, and provides fair compensation for workers facing seasonal layoffs during the summer, is major victory for HUDS workers and their allies on campus. Following the announcement of the strike, which began on September 17 when the workers’ contract expired, more than a dozen student organizations at Harvard Law School released a statement in solidarity with the workers, and a petition started by the undergraduate Student Labor Action Movement (SLAM) garnered more than 3,000 student signatures in support of the workers’ demands. Students also held multiple walk-outs and sit-ins led by SLAM, and joint student-worker rallies attracted more than a thousand participants. One of the organizations leading the student effort at the law school, Reclaim Harvard Law, also released a bilingual statement specifically addressing the racial justice component of the workers’ struggle. Following these actions, Harvard’s Undergraduate Council, the Law School Student Government, the Kennedy School Student Government, the Crimson Editorial Board, the Cambridge City Council, the Boston City Council, and The Boston Globe all published official endorsements of the HUDS strike. The National Body of Students for a Democratic Society (SDS) also released a fierce statement of support, and the World Federation of Trade Unionists proclaimed solidarity with the HUDS workers at their recent meeting in South Africa. Readers who want to hear more about what life is actually like for the thousands of working-class employees at the country’s wealthiest educational institution should start with the fantastic op-ed written by Rosa Ines Rivera, herself a HUDS employee. Collin P. Poirot, a second-year student at Harvard Law School, is co-chair of the Harvard National Lawyers Guild.